James Kirchstein, Wisconsin's Very Live Radio (WVLR) station chief engineer and originator, inside his recording company, Sara Sound Productions, Inc. WVLR and Sara Sound Productions were located in Sauk-Prairie. Kirchstein recorded jazz, country and folk music, much of it appearing on the Cuca label. 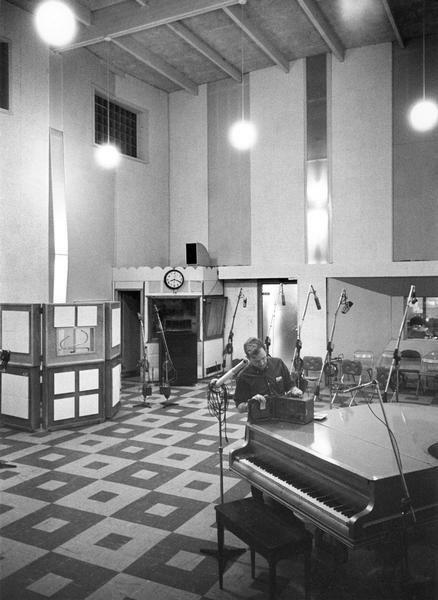 Caption reads: "Dwarfed in studio, Kirchstein awaits combo for record cutting." This image was printed in "Harvester World" magazine (Feb. 1965, pg. 29). Photograph taken by IH photo editor Angus McDougall.